This project is modeled on Marc Jansen’s WavesLPoSDistributer and follows the same conventions as much as possible. The objective is being a drop in replacement. Following the same architecture has the added bonus of being able to verify the correctness of each script’s output. There is some overlap with functionality provided by Waves data service API and Waves blockchain — PostgreSQL sync scripts, but these projects currently don’t provide all the information required to calculate a node payout (namely the lease information). As in WavesLPoSDistributer you can use the payment utilities to execute payments for any file that conforms to the payout.json format. So if you have any home brew utilities that write their output in this format you can keep on using them as usual. When will we have Waves LPoS Distributer Tool? It works in just a seconds on any leasing pool. 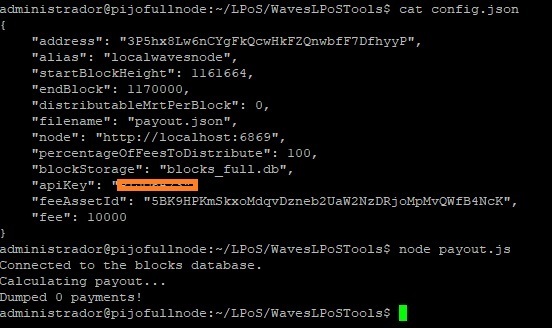 Maybe in the future I’ll change the code to retrieve the statistics with Waves data service API and Waves blockchain — PostgreSQL sync scripts which are being developed by the Waves Platform team. The payment scripts will still be useful I hope. Let me know if you see any issues. Downloading the blockchain and creating the database will take some time, but after that the updates should be quick. Hi, can you put the blocks.db in a URL for downloading? The database store all nodes entries. Currently I only have a good snapshot of blocks.db for Mainnet (but you shouldn’t use the payments scripts with that one). You can try the db update and the payout calculation though. The copy of blocks.db I have for Testnet is currently a work in progress, to add more info about other transaction types I have to start from scratch. As a security precaution remove your apiKey, accidents happen! You’re calculating the payout for waveslocalnode right? The file you downloaded is 95 424 512 bytes? What version of nodejs are you using? I think I’ve spotted the issue @Raul_localwavesnode instead of startBlockHeight use startBlock in the configuration. I’m going to correct the typo in config.json.sample immediately and push it to github. Hello @Raul_localwavesnode have you confirmed that things are working correctly after the changing that parameter name? I want to include you in the Acknowledgements sections of the README.md for the project, how should I refer to you? A name and a link would be perfect. Yes of course, It works! I’ve linked to your github profile and I mention localwavesnode. In the next few days I’ll add some more updates to the code. I’m making changes to enable our node’s new policy (distributing 100% of the fees but subtracting the cost of transferring the payout to leasers). Following some thorough testing and some bug fixing the code is now production ready! Get it on WavesLPoSTools gitbub page. If you’re having trouble with downloading the blockchain information try adding the batchSize option to your config file. Is there any way not to pay Leasint’s rewards from a specific address? Example, XXY address allocated 1000 Waves but is a wallet my stay that is always offline, and I want the reward to be sent directly to another YYX wallet. Would you have to put this function in the program?